I haven't been looking at the charts. Looks like a southerly is moving thru today? Yet the forecast temps are still rather high. What changed in the forecast with the storms? Tomorrow was meant to be a very good day from what South Brisbane storms posted a few days back . Now nothing ? Looking at the models, the Bureau's forecasts look pretty on the mark for what to expect today and tomorrow. 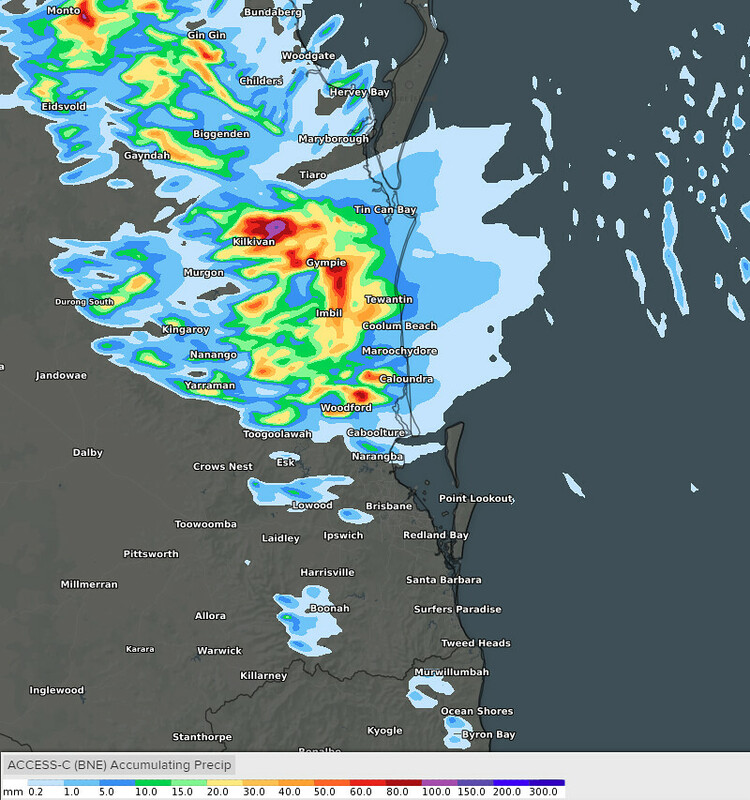 Basically, higher chances in northern SEQLD (more-or-less the Wide Bay / Burnett region). Lower chances in the southern half of SEQLD, and if storms do form they'll more likely favour places nearer to the ranges. quote from the SBS page a few days back "At this stage Monday is looking like the pick of the days, but there could also be some storms around inland and southern parts on Saturday and Sunday"
From North Coast Storm chasers "especially on Monday where we might see widespread storms develop and possibly even become severe "
They both posted storm maps for Monday which was widespread. I'm not being critical that the forecast was wrong, although we did get activity on Saturday evening. It's more so why the storms didn't develop today so we can have a better understanding. I spy with my little eye something in the Tasman sea beginning with H.
I agree with some of the earlier comments about green drought, and particularly so for areas closer to the coast. Recent showers have greened up some veg compared to the dismally dry status a few weeks ago. at depth our landscape is short of the normal moisture levels. A few more weeks of dry weather will see this temporary green colour disappear. A period of March and April typically expected rain would be very welcome to restore the balance of dry and wet weather. Mega, cyclones go where they want to. If I remember correctly the months leading up to cyclone Marcia were reasonably dry, at least here anyway. I looked back at a wetter period and saw the high pressure systems do not plant themselves there on a perpetual basis but are here today gone tomorrow. Cyclones go wherever the steering influences such as nearby midlevel ridges, upper troughs, etc steer them instead of just random motions. Sometimes the track is highly predictable if the steering flow is clear cut and sometimes it’s not if there’s competing steeering influences pulling at it and they have an erratic track as a result. In certain situations, a large TC can also affect a big enough area of its surrounding mean flow that it influences its own track but in all cases, TC tracks are governed by the laws of physics and the steering influences pulling at it. Oswald was squeezed between two highs down the coast of Aus. Debbie was similar I believe. Without them we would have never seen them here. It's that background moisture ingress from the deep mean E'ly flow from a decent high, not the very weak mobile highs we've had this summer which supplies the background rainfall for the sub-tropics ....and that has gone totally missing this summer. It's making summer rainfall for the sub-tropics much less reliable, a statistic that can be hidden in generalised analysis by the increasing boom or bust nature of rainfall. ie, if we get nothing and then an ex Debbie or Oswald scenario summer rainfall might look close to normal in terms of its overall precipitation. It's the distribution of that rainfall that seems to be changing. Hopefully we'll get something from the next round of showery pattern from the end of this week. Don't really want a flood. It's bone dry here with 2 days of extreme temps ahead. It seems to be a feature of the modern social media age that people are fixated on rainfall "events" but it's the stuff in between that is probably more climatologically important for certain bioregions. Great analysis mammatus and Mega. Convective rainfall from showers and thunderstorms associated with troughiness in summer also helps in this area too but when that source of rainfall becomes less than usual, that exacerbates the problem. Above is ACCESS-C's latest suggestion (via Weatherzone Layers) for accumulated precip between 4am and midnight tonight - one thing that makes me a bit nervous about today's thunderstorm potential is the fairly strong capping that some models have in southern parts as well as a midlevel inversion and not-so-ideal moisture so guess we'll have to wait and see if the strong steering winds aloft can still manage to advect inland cells into the more unfavourable areas. No southerly change today but there's still some good aspects about today's setup such as the shear and there should still be activity in our general region though. Nice to see you back Ken. I'm primarily a lurker but very much appreciate reading your astute analysis. I wouldn't write things off yet - models currently disagree on extent for today. I'd just monitor the radar and play it by ear. Should still be showers or storms in the general region. Looking at 23Z temp trace a temp of 36/37 deg needed to produce and MAINTAIN a TS locally. 2 rapid fire cells over Emu Creek and Crows Nest but no lightning showing. Moving very quickly to the South East. Very hot but a nice breeze coming off the Bay ATM here at Bracken Ridge. Hey nice to see you back Ken. Nice input by everyone too. Thanks. 7 registered (snoopydoo, Homer, petethemoskeet, Kino, Knot, bd bucketingdown, Weary), 71 Guests and 2 Spiders online. Generated in 0.018 seconds in which 0.004 seconds were spent on a total of 15 queries. Zlib compression disabled.